A dram shop (or dramshop) is a bar, tavern or similar commercial establishment where alcoholic beverages are sold. Dram shop liability refers to the body of law governing the liability of taverns, liquor stores, and other commercial establishments that serve alcoholic beverages. Under dram shop laws, businesses that sell alcohol can face civil liability for injuries that their intoxicated patrons inflict on third parties – even after those patrons have left their premises, and (in some states) even when the injury caused is intentional. Within the U.S., laws that impose potential liability upon businesses that sell alcohol for injuries caused by their patrons are usually called dram shop laws or dram shop acts. Generally, dram shop laws establish the liability of establishments arising out of the sale of alcohol to visibly intoxicated persons or minors who subsequently cause death or injury to third parties (those not having a relationship to the business that sold the alcohol) as a result of alcohol-related car crashes and other accidents. In simple terms, dram shop laws hold retail establishments liable for damages caused by serving alcohol to an obviously intoxicated patron – and in some cases – the owner of a bar, restaurant, tavern or other establishment can be sued if an intoxicated patron causes a car accident. The majority of states allow for recovery when the defendant knew (or should have known) the customer was intoxicated. Some states have attempted to address this problem through more exacting tests. Many states impose liability on social hosts as well as commercial establishments. This related area of the law is known as social host liability. The intent of dram shop laws is to encourage bar owners to train employees to recognize when this point has been reached by a patron, and cut off any further service or sale of alcohol. When this guideline is ignored, it becomes much more likely that a patron will leave the bar and cause some kind of harm to himself and/or others by causing an auto accident. It might also be that the patron becomes belligerent with excess alcohol and engages in a fistfight with other customers at the bar. Both types of behavior are clearly unacceptable. Which states have Dram Shop laws? Dram shop laws vary from state to state, but 43 states enacted dram shop laws in some form in response to the large number of DUIs that cause catastrophic injuries or wrongful deaths. These laws allow some degree of liability against drinking establishments who allow visibly intoxicated patrons to drive away. States that do not have dram shop laws include Virginia, South Dakota, Nevada, and Maryland. California has enacted a law specifically prohibiting civil liability of people, bars, and alcohol retailers that serve alcoholic beverages to those that subsequently cause injury or death to others. 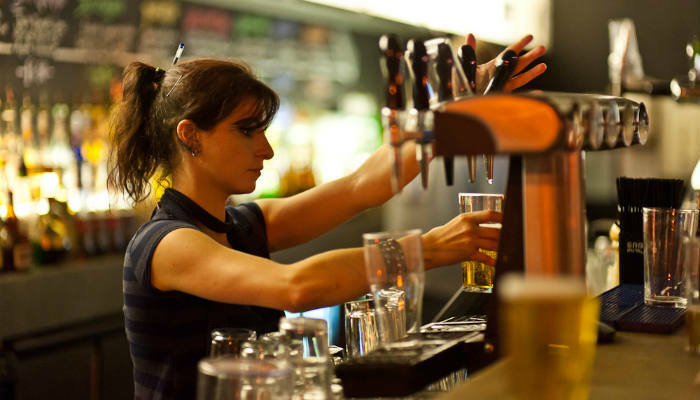 Alcohol Seller-Server training can mitigate liability during a lawsuit involving intoxication by providing evidence of intent on the part of the establishment that serves and sells alcoholic beverages. This defense is called a “reasonable efforts defense” or “Safe Harbor”. Require employee training with an approved training course. Confirm that employees have attended training and are re-certified as required. Maintain documentation of training of each employee who serves alcohol. Maintain written policies against the over-service of alcohol and develop procedures intended to prevent such over-service from occurring. Ensure compliance with the written policies and procedures that are put in place. Discipline those employees who violate the policies, up to and including termination.